Porsche Cayenne Performance, Engine, Ride, Handling | What Car? Put simply, there’s no such thing as a slow Cayenne. Even the weakest variant gets a 3.0-litre 335bhp turbocharged V6 that’ll accelerate from 0-60mph in less than six seconds. It pulls strongly from low engine speeds but does start to feel strained at the top of the rev range. The next step up is the Cayenne S. Its V6 may be slightly smaller at 2.9-litres, but an extra turbo means it’s a second quicker to 60mph. It’s more muscular low down and is far happier being taken to the redline. Given the Cayenne’s sporty remit, it feels like a better fit. The Cayenne Hybrid is quicker even than the S - and most hot hatchbacks for that matter - becasue it retains the 3.0 V6 petrol engine of the standard Cayenne with added zip from an electric motor. In fact, it's one of the fastest plug-in hybrid SUVs on sale, bettering the pace of premium rivals such as the Volvo XC90 T8 and Range Rover Sport P400e, while managing a real-world electric-only range - on a fully juiced-up battery - of around 18 miles. At the top of the tree is the frankly bonkers Turbo. Its mighty twin-turbo V8 has the kind of performance that would have been the preserve of supercars a few short years ago. There’s enough pace to overtake with ease although you do have to keep an eye on your speed – you’ll reach any legal limit far faster than you might expect. If anything, that’s the Cayenne’s biggest problem; they’re all capable of rapid acceleration, but they hide their speed a little too well. The standard Cayenne, E-Hybrid and S models come with steel springs as standard. It’s a softer set-up than what you might expect, but that unfortunately doesn’t stop the car from thumping over potholes and expansion joints. We wouldn’t go as far as to say it is uncomfortable, but it lacks the pliance you expect from a large SUV. Therefore, we’d recommend the optional air suspension (it’s standard on the range-topping Turbo model). In Comfort mode, the ride remains relatively firm, but it never crashes or bangs like the standard steel set-up. In fact, you hear the impacts more than you feel them – a common trait of air suspension. Another upshot of choosing air suspension is that you won't find any float or wallow even at high speed. Any undulations are dealt with quickly and without the excess body movement that you so often find in big air-sprung SUVs. It’s worth mentioning that all of our test cars were riding on big alloy wheels that won’t have done the ride any favours. In fact, if you want to avoid paying London’s Congestion Charge in the E-Hybrid, you’ll need to choose a low-spec car with smaller 19in wheels. Ultimately, though, the Audi Q7 and Range Rover Sport are more comfortable cruisers. Despite being bigger than ever, all versions of the Cayenne have lost a bit of weight, helping them to handle very well given their size. However, once again, we’d avoid the standard steel springs; they allow the car to pitch and wallow in Comfort mode, whereas the optional air suspension keeps everything nice and tight and stops the Cayenne from rolling in corners. Sport mode firms things up further, so it’s even more willing to change direction quickly, while Sport Plus mode should only be used when the road is particularly smooth. 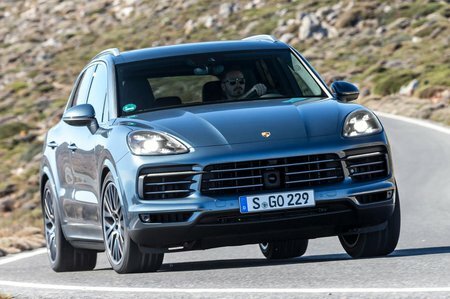 And should you want the ultimate in cornering control, you can get four-wheel steering to make the Cayenne feel more nimble in low-speed corners and more stable as speeds increase. Air-sprung cars also have the option of active anti-roll bars that virtually eliminate body lean. Even with four-wheel steering, the V6 cars are easy to place on the road; you won’t find yourself making multiple steering inputs as you corner. 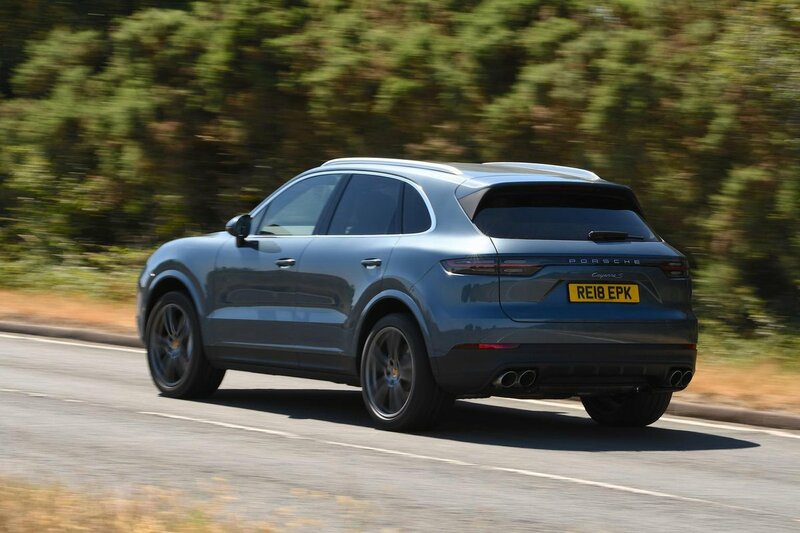 The extra weight of the V8 in the Turbo model makes the steering a little less accurate, although no Cayenne gives you much feedback through the wheel. Weight build-up is good, however. Grip levels are very high, and while you’ll feel the nose slip first, you can neutralise this with the accelerator. If you’re really committed, you can even make the rear tyres slide. All Cayennes should manage most off-roading that’s asked of them. If you’re planning to venture further off the black stuff, air suspension allows you to increase the ride height and an off-road pack is available. It’s unlikely that you’ll have any complaints about the petrol engines. All are smooth under normal use, although the entry-level V6 can sound a little strained when worked really hard. The V6 in the S variant is a little louder, but it’s an appealingly sporty noise that suits the more dynamic character of the car. As for the V8 in the Turbo model, it makes a menacing rumble under normal use but the Turbo doesn’t sound quite as fruity as the S when you’re going for it. In the E-Hybrid, you won’t hear any noise while you’re in electric mode, of course, although the V6 petrol makes its presence heard with a raucous noise when it joins in. All models come with an eight-speed automatic gearbox as standard that glides between ratios and is pretty responsive to manual commands as well. Wind and road noise are well contained but the rear suspension is surprisingly loud in its operation.